#OneWeek100People2018: Day Four: Selfie Series! 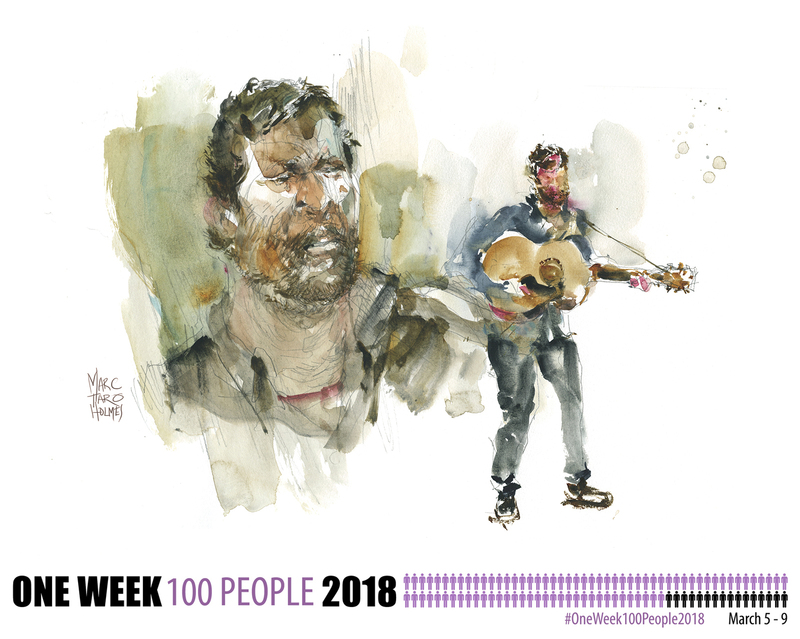 Day Four – and that’s my 100 people for #OneWeek100People2018. This first one isn’t a great likeness. But it’s a nice Direct Watercolor. Bold shapes, wet-inside, dry on the edges – the shape IS the drawing, right? #OneWeek100People2018 is a great time to try out a selfie series. If you can take an evening and bang out five (or more) in a row, perhaps you’ll see the benefits of repetition. 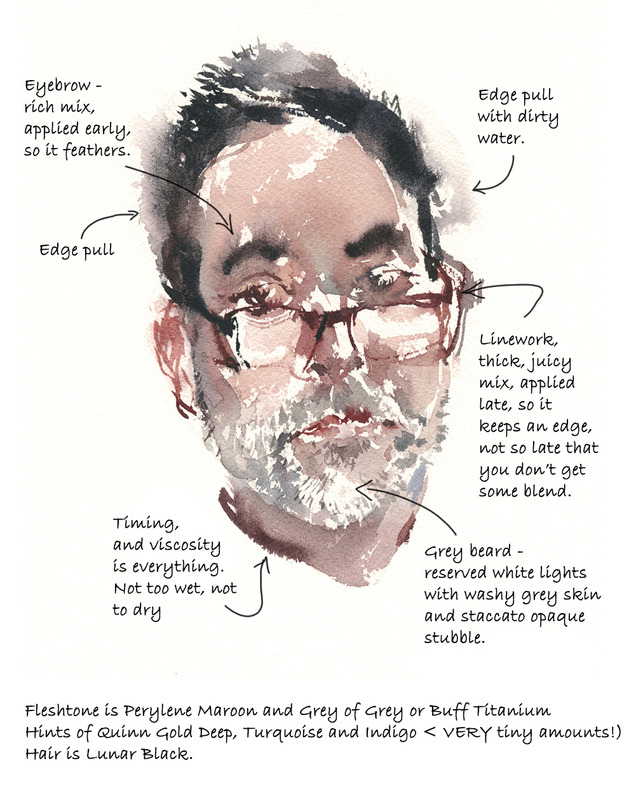 If you can sketch someone (or something) more than once, you’ll start to memorize the features. Each one gets a bit more on-target. To be honest, I’m not the best portrait artist. It’s an artform where accuracy counts, and I’m too impatient for that :) I hedged my bets sketching Dave Allen the other day, so I committed to doing these straight into the paper without a sketch underneath. When you know you get more than one shot, it’s less stressful. BTW, Note the use of the background tone to draw the lit right side on that third head. Negative painting! The first one is flattering via simplification, but the last one is a little bit more accurate I think. It’s still El-Greco-stretched. That’s like a visual tic of mine. Anyway – good exercise – and I think if I kept going – like, if a person did 100 of JUST selfies (maybe next year?) – I think you’d really make some painting breakthroughs. Maybe tomorrow I might keep going? We’ll see. I’m bored with my own face. But that’s a good reason to keep at it. Maybe it could force out some new brushwork or more daring color choices. Ok – that’s it for now – how are you doing with your #OneWeek100People? Post your progress in the comments! It’s getting down to the wire! ← Are you checking out other people’s #OneWeek100People2018? These are absolutely wonderful! Thank you for all the comments on the last portrait above giving us a better understanding. Years of practice training your eye to see and hand to follow strengthened your ability. Practice does make perfect! You inspire me. Thank you. I love to hear what other artists use for skin tones. Never thought to use buff with a red before. Must try. Nice work. I do portraits and you don’t give yourself enough credit bc you caught the likeness. They are never perfect unless projected from a photo! I keep your pamphlet, “Tea, Milk, Honey,” by my computer and will be doing water color when in Wisconsin for a month. I love the way you used your technique for a selfie! I know the answer already: practice but I wonder if within your blog, classes and other materials you could pin point a way to find the shadow shapes. I have a problem I only seem to find the very light or very dark, so I mess up my paintings because either use things really watery light or I go and dump a big blob of black or grey. It works super great using the pentel brush pen but not so much with watercolor. With watercolor everything is either a highlight or a dark dark.. :( my eyes refuse to pick up mid-tone shadow shapes.. Anyway, I’m enjoying your “people” sketching so much! Thank you for sharing. You are lucky to have such an interesting and handsome model for your work! Keep him around. I’m 22 away. May have to do away with touching up and adding color to a few of them and post as is. The last one I did was from a black and white photo with 17 aviation sailors including myself about 6 months after joining the US Navy in 1980 which has bought me to 22 left. 22 – that seems temptingly close! If you pull an all nighter to finish – it’ll be great to say later you made it under the wire! These are terrific. 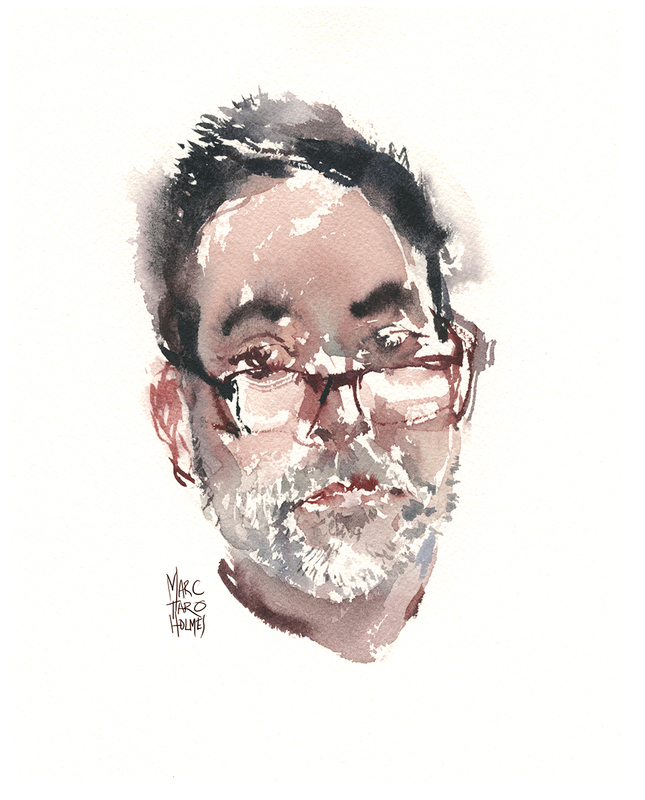 I have done self portraits years ago for art school but not for many-years. Now I will try with watercolor. Funny–bored with your own face. Doesn’t bore me. Love these portraits! Not ignoring you guys- here’s the thing- Liz and I, who do this together, really need it to be 5 days. It’s a big chunk of time so we need to keep it under control. You can do the work the weekend before – ITS OK! – it’s probably a good idea!! Just know the big push to post and discuss will be M-F. It’s ok to bend the time to suit you :) No sketching police coming around to check up ;) You do you grrl! Love these and the comments on technique. Are you looking in a mirror as you paint these? Would love to know how you managed to do this self-portrait. Did you look in the mirror or take a series of photos or….? I got up to 105 today because I went to life drawing (it almost felt like cheating — all I had to do was draw, not go out looking for people ;-) )! It was great fun all week, and I REALLY enjoyed tiny brush pen sketches to capture gestures. As for 100 selfies. . . I did that about 5 years ago when I was just starting to sketch as an exercise in self-torture, I guess. Never again. 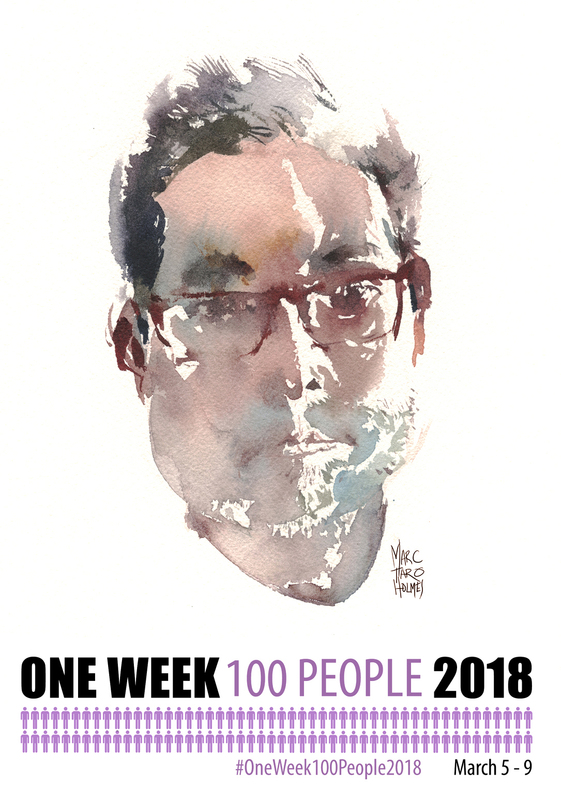 ;-) Thanks for promoting #oneweek100people each year — it’s great practice, and I love seeing all those sketches online! Haha – “exercise in self torture” haha! You’re a great artist — and teacher — Marc. I’ve taken all your classes on Craftsy and highly recommend them. I’ve never considered a selfie for #oneweek100people2018. I’m so far behind this year (crazy time at work this week) I’ll have to extend it through the weekend just to come close, but I am going to hit 100. Those bike sketches are just beautiful, Man! You have a rare gift in being both a talented artist and teacher. I’ve learned a lot from you (in fact you got me into water color, which I was terrified of!) thanks for sharing your artistic insights and talents. Day 25 : #30x30DirectWatercolor2018; FINISHED!! !